A short segment from the Locations and Effects 2013 documentary with Academy-Award winning effects supervisor Craig Barron and the author filmed for the Criterion Collection release of the Safety Last! Blu-ray appears below. Overview Tour of Cahuenga at Hollywood Blvd. Tour silent-era Hollywood with this PDF guide listing over 50 locations around town. The tour takes you to several spots right in Hollywood, as well as the sites for the Lloyd, Chaplin, and Keaton Studios. The tour is annotated with corresponding page numbers (SV) from my Harold Lloyd film location book Silent Visions, (ST) page numbers from my Chaplin film location book Silent Traces, and (SE) page numbers from my Buster Keaton film location book Silent Echoes. Locations that are not annotated represent the many new discoveries not appearing in the books. In conjunction with my presentation of Speedy on October 16, 2011 at the Museum of the Moving Image, 36 01 35th Ave., Astoria, NY, at 3:00 pm, this tour shows the Brooklyn locations appearing during the film. Of course the Coney Island sequences from the movie were also filmed in Brooklyn, but I cover that as an entirely separate chapter in my Lloyd book Silent Visions. Freelance UK film journalist Jonathan Melville arranged for me to give him an impromptu tour of Hollywood Boulevard and Cahuenga, a street where Buster Keaton, Harold Lloyd, and Charlie Chaplin all filmed scenes. Here is what Jon put together, as posted on YouTube. Lloyd on a set built atop the extant building at 908 S. Broadway, with the extant Hamburger’s (May Co.) Building at the SW corner of 8th and Broadway to the rear. In conjunction with the Los Angeles Conservancy “Last Remaining Seats” screening of Safety Last! on June 25 at the Orpheum Theatre, I am posting here a self-guided walking tour of the downtown Los Angeles locations Harold Lloyd used in his 1923 silent classic, along with locations from Lloyd’s climbing stunts in Never Weaken (1921) and Feet First (1930), and behind the scenes images showing how Lloyd staged his famous skyscraper-climbing sequences. I just got through viewing/listening to the Criterion 2013 release of “Safety Last!” and while I knew a few things, this was helpful. I also listened to the commentaries on the 3 short films, particularly “Young Mr. Jazz”. In that commentary you noted one location that you had no idea where it was filmed; this was when Harold picks up Bebe in his car and goes out for a date (followed by the over-protective father). In searching on the internet for information about Bebe Daniels (I was curious what happened to her after the “break-up”) I found this one website (among others) and on it, there is a picture/drawing of Bebe’s Beverly Hills’ estate (before she moved) and darn it, it looks pretty darn close to the house shown in the scene. It would also make some sense since these Silent-Film folks used and filmed anywhere and everywhere. I also like to make another observation, this time about a scene in the movie, “Safety Last” (in which Mildred Davis is in a yard receiving mail/gifts: Another house). In this scene, she opens up a “Lavalier” which Harold has mailed her. I would like to point out in the side-shots we get before/after she opens the case (before she reads the letter)…well, there is “something” in that case and it is “huge”, but it is NOT the Lavalier shown. It is mentioned int the commentary that Mildred was afraid of heights and Harold bought her something (a gift) to coax her up there : I forget the exact phrase, but I think it may’ve been a necklace and this is what she actually opens up in the scene and what we see on the side-shots. Maybe this was part of a good-natured prank to surprise her with her gift for going up on the roof? Again, the thing she opens up is severely diamond-encrusted with strands; it could be a tiara or some necklace. Maybe Correll should make note of it? You don’t happen to know if the clock set from Safety Last happens to be preserved anywhere? Thanks for your time and the effort you put in this website. Hi Brian – I don’t know what happened with the sets. Apparently they received limited city permits to build the sets on the roofs, and had to quickly remove them once the permits expired. 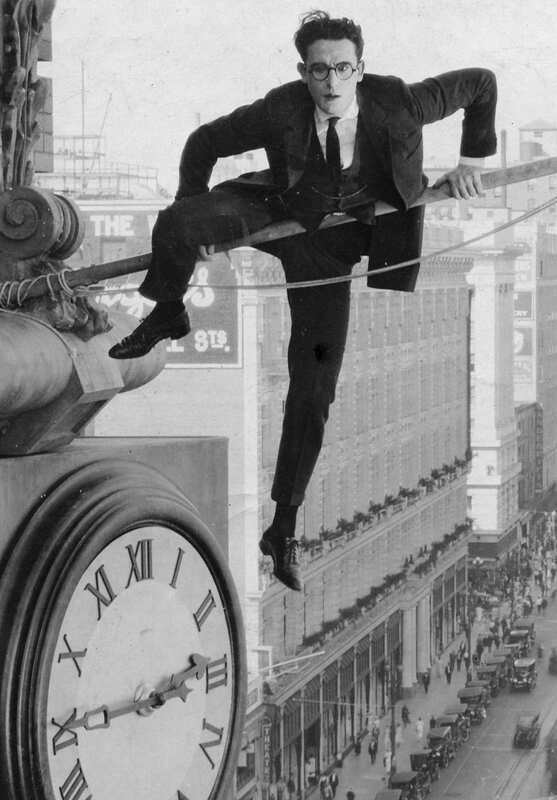 Secretively Lloyd took no “behind the scenes” shots of the clock sequence, even though he took comparable photos of how they filmed “Feet First.” The Roach studio filmed many other stunt climbing comedies, such as the 1924 Our Gang “Seein’ Things” where Farina climbs along the edge of a high building that looks quite similar to the rooftop edge set from “Safety Last.” So they might have recycled parts of that set, or maybe they kept the plans, and used them again to build a similar set.